In The Language Instinct, Steven Pinker described language as a nearly miraculous tool for getting our thoughts out of our heads and into others'. That is, language is a tool for communication. Now, some linguists might argue that while language is used for communication, it is not primarily a mechanism of externalizing thoughts. Every time one of us experiences a linguistic misunderstanding, or observes one, we have to write it down. It's a kind of fun project, but this post is specifically about these pads. It occurred to me that we could set up a google form, and have people submit misunderstandings online, automatically compiled into a spreadsheet. 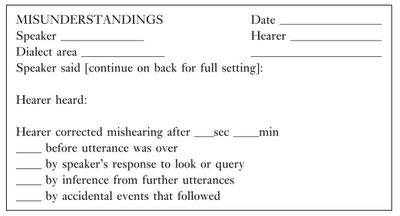 As I started setting up the form, I realized that no one was going to want to use it, because it wasn't that cool. To be cool enough for people to be engaged with the collection of data, I'd need to create an iPhone app. Or, pass out pads of paper. Here's the weird thing. These misunderstanding pads are cool. Everyone I've mentioned them to wants one. And then, once they get them, they carry them around and collect a bunch of data. But they're completely analog! How could something so drastically old fashioned be cool and interesting? I guess that once something becomes so old fashioned, it can be just as novel as the newest, cutting edge thing. An online form is at median banality, but analog pads of paper, and smart phone apps are interesting outliers, albiet on opposite ends of the distribution. You have to wonder if one day, there will be an expensive and fashionable phone marketed that can only place calls, kind of like Shaker furniture. On the Sociological Images blog, I saw a graph posted displaying the relationship between family income and average SAT score. I wasn't exactly sure how the axes of the graph related to meaningful ranges, so I've recreated it her, superimposing average SAT scores for a few Philadelphia area colleges. The dark line connects the average score for students on each test within each income category. Each labeled colored line indicates the median SAT score for Philadelphia area colleges. The dashed vertical line indicates US median household income. 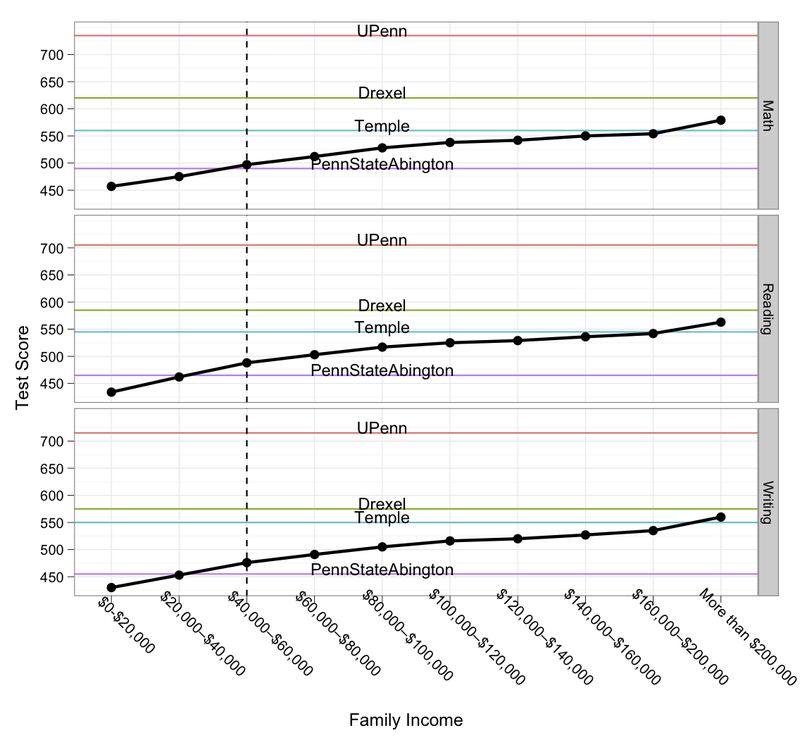 As you can see, UPenn is far outside of the range of even the wealthiest income group. Being wealthy seems to get you from Penn State Abington to Drexel or Temple for free. 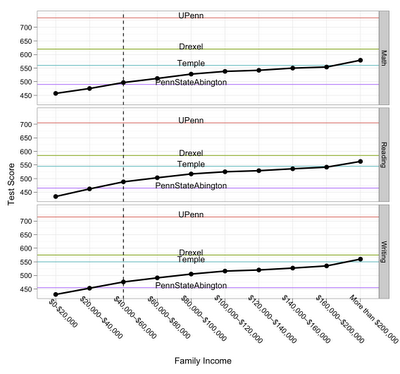 Everyone has to work hard to get scores to get into UPenn, but students from wealthy families have an edge over students from poor families, or even median income families. "Disadvantaged students are defined typically not by a bad thing that they have, but rather by good things that they don't have: financial resources, a high-quality education, and so forth. In contrast, advantaged students get all sorts of freebies." All high school grades on a 4-point scale (A=4, B=3, etc). No more of this 5-points-for-an-A-in-an-AP course. Subtract points for taking the SAT multiple times. Subtract points for taking longer on the SAT. Subtract points for taking a commercial coaching program such as Kaplan, Princeton Review, etc. Subtract points for going to a private school. Subtract points if your school (public or private) has its own SAT preparation program. Now, some commenters thought this was unfair for reasons that are kind of fuzzy. We could take the definition of "privilege" in this context to mean unequal outcomes for equal efforts. Wealthy kids who take SAT prep classes don't, by definition, work harder than poor kids, but they will receive better outcomes. Others said, "Shouldn't parents with means be allowed to buy the best education for their children?" Given the premises that some schooling is better than others, and that with better schooling comes better economic opportunities, I think it is only reasonable that parents try to do the best that they can for their children. However, the normative suggestion that it should be the case that you can buy a better education is an offensive social attitude to me. However, here's a super cynical thought experiment. Let's say that you could implement a perfect privilege normalizer for SAT scores, either by boosting the underprivileged or by deducting from the overprivileged, so that only the true aptitude of students shone through. How would this affect the college admissions process? Well, let's take the purpose of college education to be purely status conveyance. At least, it's status conveyance that separates elite colleges from the rest. To be an effective status conveyer, you need to be careful about who you convey it to. That is, you need to be sure that you're only conveying status to the right kind of people. That is, you should only convey status to people who already have status. So as it stands now, you're very lucky as a college, because people with more status do better on the SAT, but the SAT appears to be meritocratic on the surface. Hey presto, there's your gatekeeping device. What happens when you take away the status effect on SAT scores? The SAT becomes a poor gatekeeper. Therefore, I would predict that if SAT scores were effectively normalized for privilege, you would see a de-emphasis of their importance in college admissions, and a redoubled emphasis on the qualitative materials, like extracurricular activity resume, and writing sample.